One Day cricket matches were introduced in English county cricket in 1962 to spread the game, and by 1963, the format had caught on so well that all first-class teams in England played in a One Day cricket tournament. Twelve years later, the rest of the cricket-playing world had succumbed to the One Day bug. 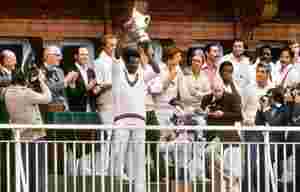 Six Test-playing nations (England, Australia, New Zealand, West Indies, India and Pakistan), joined by Sri Lanka and East Africa, played the first world championship—The Prudential World Cup 1975—in England. For 36 years, the cricket World Cup has remained the pinnacle of the sport, heralding shifts in power among the cricket-playing nations, and the heroes from each edition have gone on to stamp their presence on the game. A 64-run, last-wicket partnership between Deryck Murray and Andy Roberts killed Pakistan’s semi-final chances. Chasing a target of 267, their eighth wicket fell at 166—and with 100 runs required and only two wickets in hand, people had already started packing their bags. Keith Boyce, the ninth wicket, fell at 203. The last pair of Deryck Murray and Andy Roberts, who came in the 46th over, scored the required 64 runs for victory with two balls to spare, giving the West Indies an improbable semi-final birth. This match is remembered for several reasons—captain Clive Lloyd’s swashbuckling 102 off 85 balls when West Indies were down 50 for 3, young Vivian Richards’ three stunning run-outs (the Chappell brothers and Alan Turner), and Roy Fredericks’ famous hook off Dennis Lillee, which sent the ball out of the ground, but sent Fredericks back to the pavilion after he fell on the wicket. West Indies scored 291 for 8 and bowled Australia out for 274, with Keith Boyce taking 4 wickets. Chasing England’s 166, Pakistan were 27 for no loss when Mike Hendrick struck. Pakistan were reduced to 34 for 6, with Hendrick taking four wickets in eight balls. Pakistan recovered briefly but not enough to be bowled out for 151, and England won by 14 runs. More than a match-winning 138 by Vivian Richards, people still recall and watch videos (http://www.youtube.com/watch?v=SK_n5le73LE&feature=related) of the famous last-ball six by Richards off Mike Hendrick. Exposing his wickets and moving across his off-stump, he lifted the full-toss over midwicket. Richards also took the catch to dismiss Ian Botham off Colin Croft. Compiled by Manoj Madhavan and Arun Janardhan.